After four months of development, programming and preparation, the team “Alpha Dancers” participated in the competition RoboCup Junior in March 2016. Four students of the Arndt-Gymnasium Dahlem prepared together with their mentor Prof. Holger Schlingloff of Fraunhofer FOKUS for the competition on weekends. Meeting the Governing Mayor of Berlin Michael Müller was a bargain price of the jury for the team. RoboCup Junior is a competition for teenagers who can present their robots in the three disciplines dance, rescue and soccer. As part of a dedicated course in the Arndt-Gymnasium Dahlem, two teams supervised by Prof. Holger Schlingloff, Chief Scientist of business unit SQC at Fraunhofer FOKUS and professor for software technique at Humboldt-Universität zu Berlin, participated in the competition. The team “Alpha Dancers” with Janina and Nadine Brombacher, Elisabeth Fraenkel and Antonia Mehlig was ranked fourth in the discipline dance. In March, these were the trials for the German Championships. The performance of the team should have a duration of one to two minutes and was evaluated afterwards. Subsequent to a technical interview in which the technique and the programming were judged, the jury evaluated innovation, originality of the robots and the entertainment value. In addition, the quality of performance as well as the technical complexity and the interaction and the use of the sensors were key factors for the final results. Fraunhofer FOKUS provided the resources for the robots. 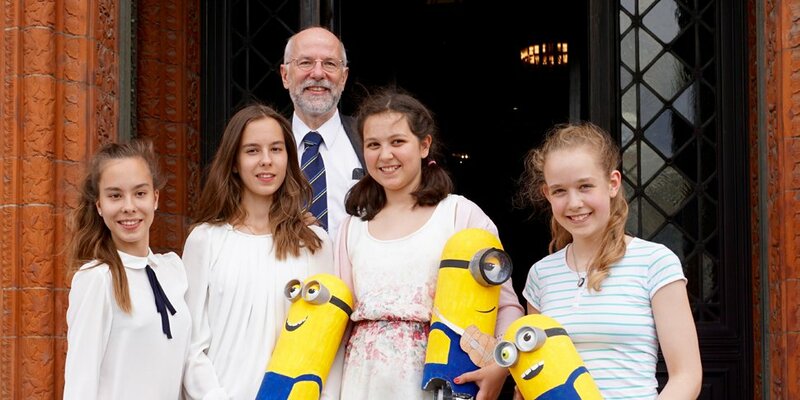 Even though rank four was not sufficient for a further qualification for the German Championships, the “Alpha Dancers” were rewarded with a special price by the jury – a meeting with the Governing Mayor of Berlin Michael Müller. The meeting took place on 30th of June in the Red City Hall. The students showed their robots and gained an impression of the everyday life of the Governing Mayor.